Greg and I encourage all Texans to join us in celebrating Women’s History Month by honoring the women of the Lone Star State who have made noteworthy contributions to our state and nation. Texas is home to one of the first female cattle drivers, Margaret Borland, and one of the first black women to serve in the U.S. House of Representatives, Barbara Jordan. The creativity of Texas women has made history books, including Bette Graham who invented liquid paper, and Selena Quintanilla, the Queen of Tejano music. Still others have made their mark through writing, philanthropy and and athleticism, as demonstrated by Simone Biles, America’s most decorated gymnast. 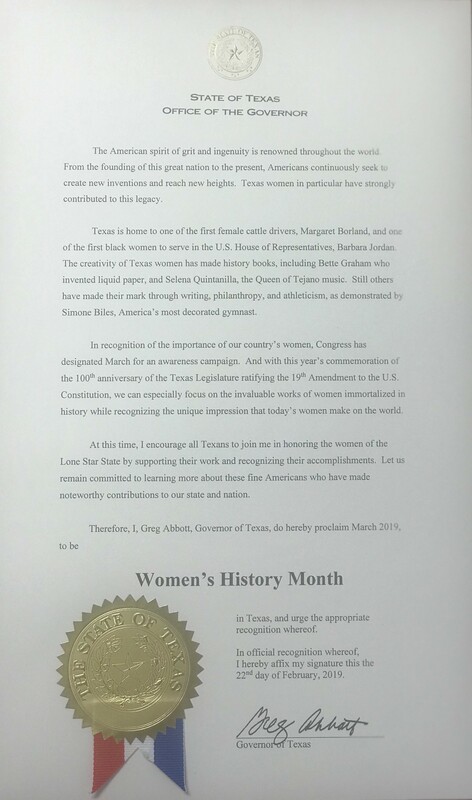 We salute our amazing Texas women this month and every month!